With just a few crafty products, it's fun and easy to create heartfelt gifts for your neighbors and friends. Find out how simple it is to make these gorgeous gifts filled with delicious delicacies! In this Close To My Heart video, we show you how to create the gift packaging featured on page 82 of our Spring/Summer 2012 Idea Book. Click on the video above or click here to watch. 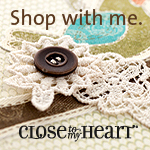 With Close To My Heart's Art Philosophy cartridge - I can make ANYTHING! I love this cartridge! If you don't have one, contact me to see how you can get a DEAL on one so YOU TOO can start making gifts and decorating your own theme parties, as well as endless ideas for cards and layouts! And THIS month you can get a deal on all stamp purchases! Buy two - get one free! Click here for more details or contact me today! Click on the image above to start shopping for your stamp deals this month!